The nation’s least favorite anti-holiday, Tax Day, falls on April 17th this year, and it’s less than a month away. Some people, who are surely just trying to make the rest of us feel bad, have already filed for Tax Year 2017 and even received their refunds already! The rest of us are counting on every hour between now and midnight on April 17th to complete our returns, anticipating the results of the worst lottery ever invented. Procrastinators who are due a refund … don’t like money? But the feet-draggers who know they are going to owe the IRS something between a penny and a kidney? They’re the Wimpys among us – gladly putting off until Tuesday what they don’t want to hear about and can’t pay today. So, what do you do when you can’t pay your tax bill on April 17th? 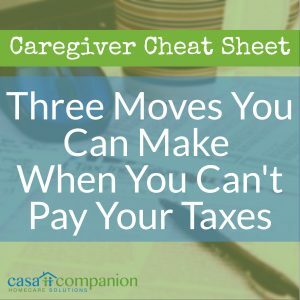 Caregivers, home care aides and seniors can all use this advice about what to do when you can’t quite pay your taxes on Tax Day. The first, foremost and fundamental tip is to file your return on time. No matter what the balance owed, or what you can send in at the time, the IRS will not accept frustration, panic, or despair as an excuse for not filing a return or an extension request by the 17th. That really makes them angry, and much like Bruce Banner, you do not want to see the IRS when they get angry. The next steps depend on how much you owe and how long you need to pull that much together. But seriously, file your return. If you need a month (30 days): Mail your return and wait for the IRS to mail you a bill. They receive bazillions of returns (actual amount: more than 240 million) that week, and it takes them a couple weeks or more to open, sort and follow up on them all. Then they’ll send you a bill, with a deadline to pay, and a small penalty on your unpaid balance. 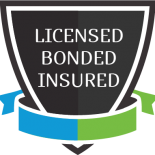 If you’re confident you can pay the balance within 30 days, and can handle the additional fee, then this is the best choice for you. If you need a month to four months (31 to 120 days): Mail your return, then apply for a 120-day payment extension online. If you owe less than $100,000 and plan to pay within 120 days, then you just pay the penalties for not paying in full and on time, plus the current quarterly interest each month on the remaining unpaid balance. If you need four months to five years (121 to 1825 days): Mail your return, then apply for a long-term payment plan, aka installment plan, online. If you owe less than $50,000 and plan to pay over years instead of months, then you pay the penalty for not paying in full and on time, plus the current interest rate each month on the unpaid balance. Set-up fees depend on whether you plan to use direct debit, check, money order or debit/credit card – direct debit is preferred and therefore cheaper. Fees: The cost to set up a payment plan depends on duration, income level, whether you’re a business or individual, and how you plan to pay.